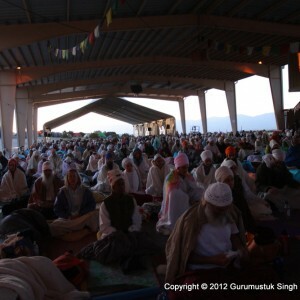 Every year close to 2,000 people come from all over the world to little Espanola, New Mexico to participate in the annual Summer Solstice Sadhana event. This is a beautiful event where people from all backgrounds and religions come together to meditate and work on themselves. I have participated in this event since I was a small child and love to take the week off with my son to have this time “away from the every day norm”. Ram Das Puri (in the mountains above Espanola) becomes like mini city for the week as people work together to make this huge camp run smoothly. It’s amazing how it is pulled off every year.